Dark leaves offer superb contrast to bright blooms. Excellent uniformity for more plants per sq. ft. and optimum shipping density. Targeted range of core and novelty colors simplifies selection. Best suited to 5-in. (13-cm) and larger pots and hanging baskets. NEW Dark Red Improved: Improved habit with more uniform branching and better garden performance. The genetic habit is a perfect match to Cardinal Red. NEW Fuchsia Berry: A bright, exciting new color for the series in a color class that does not exist in zonal geraniums. NEW Orange: A true orange addition with a great dark leaf habit that matches the series. Replaces Coral. NEW Pink Flare: Has been improved for shipment of quality unrooted cuttings. Comments: Stick immediately upon arrival. Geraniums are best rooted in media in strip form to allow for maximum airflow and avoid foliage overlap. After initial rehydration, careful misting is required to optimize callus and root initiation. Mature leaves should show slight wilting at midday and regain turgor in the late afternoon under ideal mist conditions. Leaf petiole wilting indicates undermisting. Overmisting leads to Botrytis. Remove flower buds at transplanting. Comments: Day and night temperatures of 71 to 76°F (21 to 24°C) are ideal for the earliest stages of plant development. Fantasia Geraniums usually do not require PGRs to produce high-quality plants. 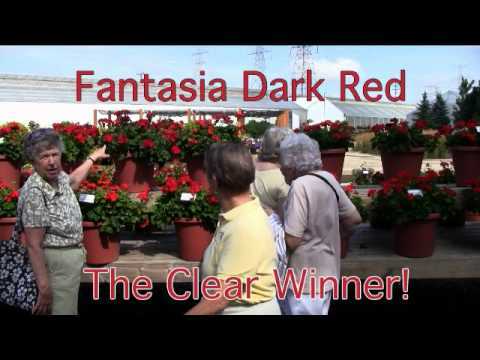 Refer to the Fantasia Zonal Geranium Grower Facts at ballfloraplant.com for detailed culture information.